A group of Pettah traders, calling themselves the ‘Victimised Pavement Hawkers Association’ (VPHA) have complained to authorities that the re-located trade stalls meant for displaced pavement hawkers had been allocated to outsiders while the deserving displaced had been left out in the cold. 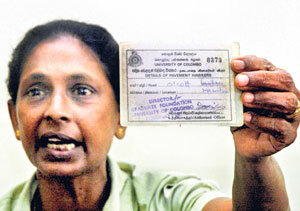 VPHA President Nalini Swarnalatha told the Sunday Times that most of the stalls constructed in Pettah and Nugegoda had fallen into the laps of those with political links and in most cases money had exchanged hands between businessmen and corrupt officials. 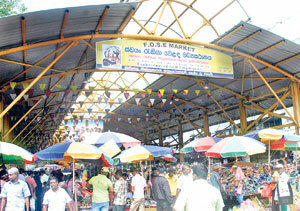 The newly set up trade stalls in Pettah. Ms. Swarnalatha charged that hundreds of displaced pavement hawkers who had plied their trade on the sidewalks for decades have been pulled out unceremoniously to give way to a modern-day trade mafia that is now deeply embedded. This mafia includes underworld operators, drug peddlers, pimps and in some cases police officers, she charged. She said the main culprit was the Self Employment Federation that enjoyed the lion’s share in the whole operation and in some cases resorted to strong arm tactics. Responding to this accusation, Mahinda Kahandagama with the Self-Employment Federation said these allegations were false. “The new outlets were given to deserving individuals who fitted the criteria. There were no exceptions or favouritism,” he said. Meanwhile authorities have ordered a full-scale probe into the allegations and have put on hold further allocation of the trade outlets until investigations are completed after a VPHA delegation met Defence Secretary Gotabaya Rajapaksa.